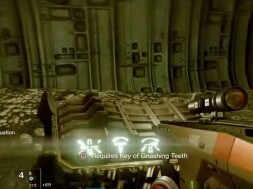 You need a key of Gnashing teeth to open the chest located under the platform in the court of oryx section of the dreadnaught. To find the Key of gnashing teeth you need to … (update coming soon!) Check out the video and watch our comment section for more details on obtaining the Key of Gnashing teeth.